Chinese Pink is a hardneck garlic classed as a Weakly bolting hardneck, along with Asiatics and Creoles. That simply means some of them grow scapes; some of them don't. Turbans are among the earliest harvesting of all garlics so you will have fresh new crop garlic before anyone else. ​Turbans are early and allow you to enjoy fresh garlic when everyone else's garlic is still in the ground and that is a big benefit. 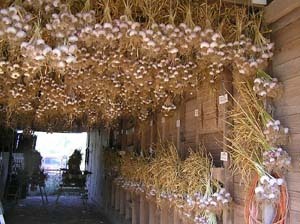 They will begin to sprout in a few months but by that time, other garlics have matured and been harvested so you still have fresh garlic if you grow other kinds as well, especially long storing ones like Porcelains, Creoles, Purple Stripes and, especially Silverskins, which are very long storing. If your long storing varieties are still good the following year when your early harvesting Turbans are ready, you never run out of fresh garlic..
Chinese Pink has a deep, rich , musky flavor but with just enough pungency to let you know you are eating real garlic and is a delight to those who love garlickiness but don't want hotness. After you have chewed up and swallowed the sample, there is a nice warm very pleasant aftertaste that lingers for a while. It has a similar taste to Red Toch and Polish White, both Artichokes and Vietnamese Red, a Purple Stripe. Chinese Pink should have a place in every garlic garden.